Rip City is turning red. Local activists with the Democratic Socialists of America tricked the Portland Trail Blazers into broadcasting a message criticizing the hoops team's cozy relationship with an Oregon scope-maker whose wares are equipped on the guns firing in Palestine and Israel. 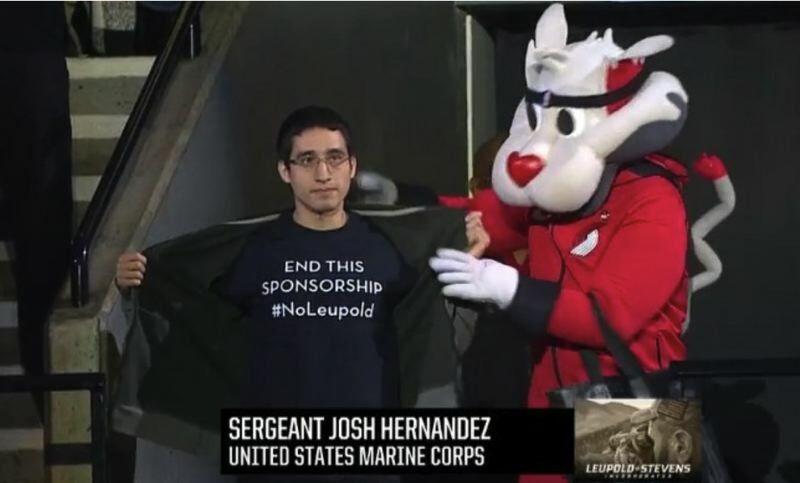 Fans may have tried to adjust their television set after seeing a man unveil a t-shirt reading "End This Sponsorship #NoLeupold" during the Tuesday, Nov. 6 Moda Center showdown against the Milwaukee Bucks. The hijacked telecast happened during Hometown Heroes, a regular occurrence at home games that offers veterans free swag in front of the cameras. The segment is sponsored by the Beaverton-based Leupold & Stevens company — and the telescopic and red-dot sight manufacturer's logo is prominently featured at that time. That doesn't sit well with some leftist activists, who are protesting what they believe are Apartheid-like conditions for Palestinians living in the West Bank and Gaza Strip. The activists say allowing Leupold & Stevens to partner with the Trail Blazers amounts to a tacit endorsement of the Israel Defense Force. "Blood money is being made by Leupold & Stevens," said Sgt. Josuee "Josh" Hernandez, the U.S. Marine Corps veteran who pulled off the protest. "I did my time. I know injustice when I see it." Hernandez — who says he "met a few presidents" while spendings five years in the Marines guarding embassies in Bolivia, Austria and Saudi Arabia — is a member of the Portland chapter of the DSA, a burgeoning political club with hundreds of local associates. The DSA and other groups like Jewish Voice For Peace have tried holding press conferences, handing out fliers and projecting messages onto the outside of the stadium, but never anything as audacious as this. Representatives for Leupold & Stevens describe the company as a "proud supporter" of active duty military, retired military and emergency first responders. "We will continue to operate our business in the most ethical way possible, including adherence to all international and U.S. export control laws, policies and treaties which are strictly enforced by the U.S. State Department. We will not be forced to submit to the agendas of outside organizations," the company said in a statement. Trail Blazers vice president Michael Lewellen added: "We are sorry that it was disrupted during a recent home game, and will make every effort to ensure that the Hometown Heroes segment — a favorite of many Trail Blazers fans — continues to honor those who protect our safety and freedom." Hernandez admits that his actions can only "symbolically subvert" the partnership. Organizers promise the DSA won't give up until the sponsorship ends. "This violence is emblematic of larger issues — a violent, extremist military-industrial complex largely headed by the United States that we need to address," Hernandez said. This story has been updated in order to clarify language about conditions in Palestine.